Assumed knowledge: This tutorial assumes you know your way around your Chictopia account and how to use an image hosting service (such as Photobucket). This tutorial is for cocorosa and any other Chictopians who would like to know how to put images and links in their ChicBlog sidebar. First you will need a image hosting account to upload the image you wish to use. I'd recommend signing up to either flickr or photobucket if you haven't already. For this tutorial we'll use photobucket as an example. Go to your photobucket main page and use the uploader to upload the image/s you want to use from your computer. 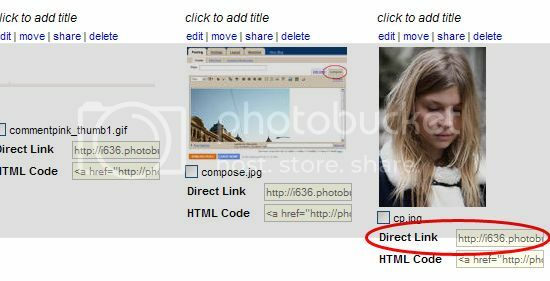 Then locate the image on your Photobucket page - under it will be a text box titled 'Direct link'. Copy the URL code in that box and go to your Chictopia page. Paste the code between the two quotation marks in the 'tell people about your style' box. You have now created an image. Between the two quotation marks paste the full web address of your destination link, eg. http://www.google.com. Don't forget to remove all the stars. You have now created a link! Scroll down to the bottom of the page and click the save button. When you view your ChicBlog page the image should show up in the sidebar.